Model update or a BIG minor change! Now were talking. Type RS and Type R get 280Hp on paper. We know wht that means. Much more in reality. Turbo charger changes pump in a heap more gas and the engine burns it up to a massive increase in power. The lowly RBasic car still gets the engine of old at 265hp and the AT remains at 255hp. A little sad really. Dont make the mistake and get anything but a type R or RS. Even though power was increased, the real focus of the NEW Rx7 as Mazda called it, was the front spoiler and rear wing aero combo. The front combination indicator and park lamps gave the whole car an update at the time when the Version I indicators were cloudy with age. The bigger air intake in the front spoiler was there for a real reason and the the lower front splitter had a harder edge to it. 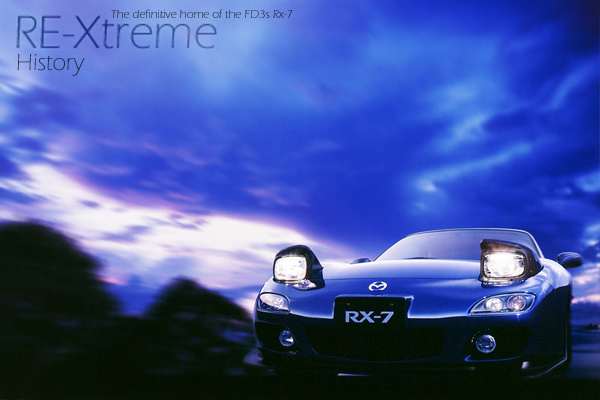 The Mazda Efini emblem was removed and the car bore the Name RX7. You could apply these changes easily to older machines too which was of great appeal to some tired looking cars. The rear wing was a nice design but personally I think it could have been slightly bigger, like the Mazdaspeed II item. But it still looks very good. 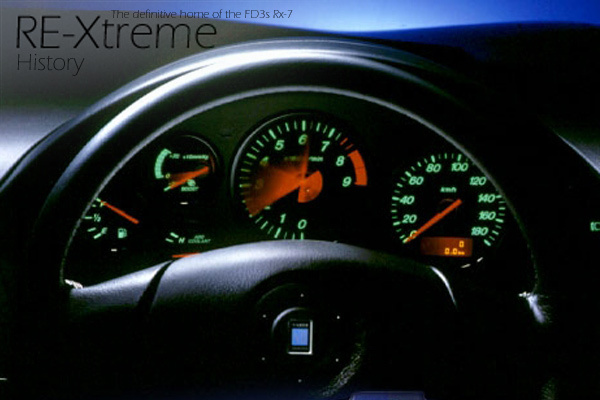 Internally the green backlit dials remained, although a funky new boost guage was added in the triple cluster. Just what you need. Hmmm. It was actually a big part of the marketing. Initially wheels were carried over from the 98 model, although this soon changed as the cars were rolled out from the curved spoke to the flat spoke design in 16" for all models and 17" for the RS. But unfortunately it was only for the Japanese Domestic Market as sales in foreign markets had dwindled due to rediculous pricing. Australian pricing was approaching $100,000AUD at a time when Subaru WRX was $40,000AUD for the same performance. A shame that it happened. I am still a lover of the original more rounded FD design for a standard car, but over the last couple of years the NEW rx7 is growing on me. Like many whose early FD dies, they now sport an engine, body panel or turbo transplant from a wrecked 99 model. A good breath of life for an old beast. TypeRS GF-FD3S 1308cc 3 5MT FR 7.2km/l 3,778,000? Type R GF-FD3S 1308cc 3 5MT FR 8.1km/l 3,470,000? 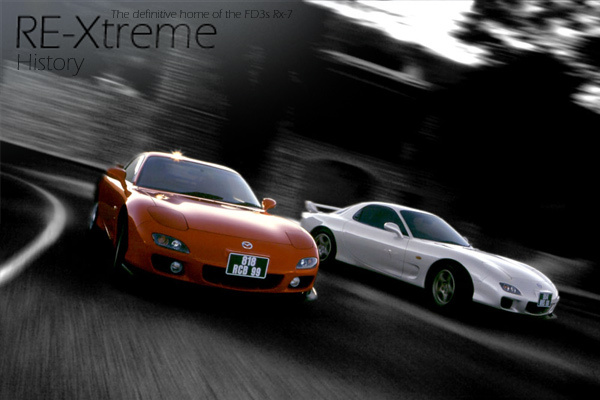 Type RB S-Package GF-FD3S 1308cc 3 5MT FR 8.1km/l 3,128,000? Type RB GF-FD3S 1308cc 3 5MT FR 8.1km/l 2,898,000? 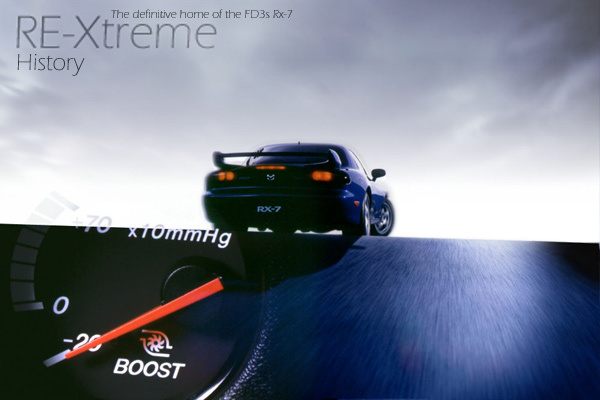 Type RB GF-FD3S 1308cc 3 4AT FR 7.7km/l 2,998,000?